William T. La Moy, a curator in Special Collections, found an important piece of University history in the archives of Syracuse University Libraries that led to a distinctive new typeface for the University, represented in the graphic above. In the depths of the archives of Syracuse University Libraries, a collection of materials highlighting a special connection between an early 20th-century typeface designer and the University caught the curiosity of curator William T. La Moy. His searching revealed an important piece of University history and, ultimately, led to a distinctive new typeface to represent the University. La Moy, curator of rare books and manuscripts at the Special Collections Research Center in Bird Library, discovered paperwork and two sets of matrices (molds to make metal type), including a typeface known as Sherman, in a collection involving revered American printer and designer Frederic Goudy. Goudy’s name may be less well-known than the names of his type designs that live on today, such as Goudy Old Style, Copperplate Gothic and dozens more. The find was serendipitous for the University. “When the typeface was discovered, everyone realized this was a wonderful opportunity to build upon,” says Nicci Brown, vice president of communications and chief marketing officer. Elements of the typeface—a vitality combined with a traditional feel—seemed to match exactly what the University’s communicators and designers were looking for. Sherman seemed to be patiently waiting in our archives to emerge and fill the role it’s so perfectly suited for at Syracuse University. Interested in the Goudy collection, La Moy had come across seven matrices for one font and another more complete set for the Sherman typeface—a remarkable find. La Moy dug deeper into the collections and found the connection of why Syracuse had these matrices and materials. “It formed this very intriguing story,” La Moy says. In 1934, Syracuse University School of Journalism Dean M. Lyle Spencer knew of Goudy’s importance and thought it would be a good idea for the new journalism program to form an association with an important American type designer. Spencer approached Goudy, who lived in the Hudson Valley and became interested in the new program. Along with being asked to join the faculty and become a consultant, Goudy was awarded a medal for typographic excellence by the journalism school and given an honorary degree. “There forms this long relationship between Dean Spencer and Goudy,” La Moy says. La Moy also learned from the Goudy collection that the Sherman font, commissioned by publisher Frederic Sherman in 1910, was gifted to the University by Sherman’s niece in the 1960s after Sherman’s death. She had learned of the connection between Goudy and the University and thought it appropriate the matrices be held by Syracuse. In 2013, La Moy wrote an article in the publication Printing History, the journal of the American Printing History Association, which detailed in part the Goudy collection and how it came to be at Syracuse University. La Moy was editor of the publication at the time. More recently, as the University looked to enhance its brand identity, in collaboration with New York City design firm Pentagram, designers exploring the University’s history found an online reference to La Moy’s article and the Goudy connection. La Moy briefed the designers on the connection and, after a design review of the typeface, it was decided that this little-used font would become the typeface for the University. The typeface was then converted to a digital form. With such a unique, compelling story, the University, in partnership with Pentagram and production company DressCode, created a brief video to highlight how it all came about. 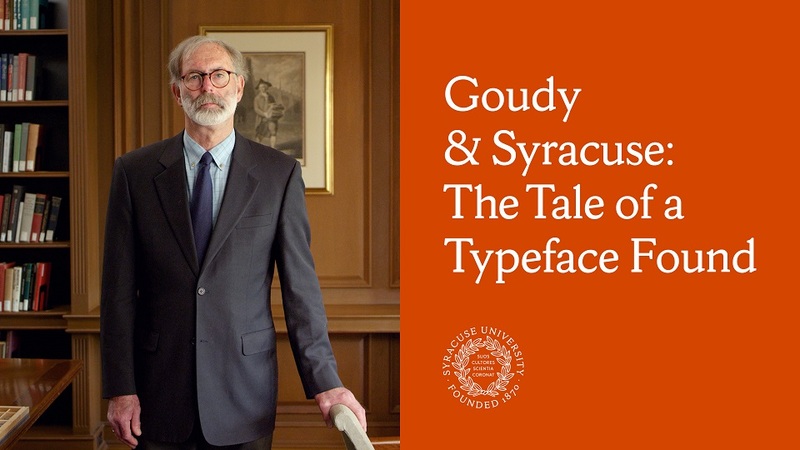 “Goudy and Syracuse: The Tale of a Typeface Found” features La Moy, Michael Bierut of Pentagram and type designer Chester Jenkins of Brooklyn, co-founder of Village Type.